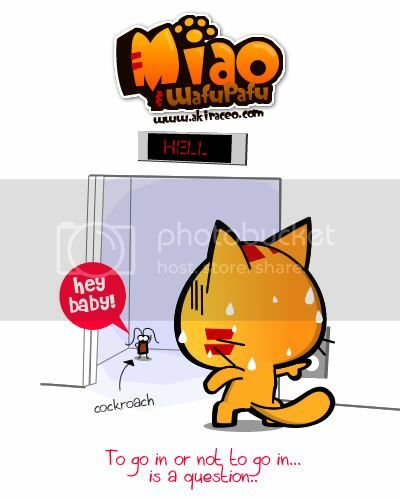 Miao & WafuPafu Comic Blog » Devil in a Lift. After 26 years, I’m still afraid of cockroach. I failed as a cat T3T. Posted on March 11, 2011 by Jian Akiraceo. This entry was posted in Outdoor and tagged cockroach, Lift. Bookmark the permalink. Freaking scary right.. especially those that flies.. I find it appropriate that you tag this as outdoor, because you are literally standing outside the door. LOL. SOMEONE SHLD INVENT SOME WEAPON TO KILL THEM ALLLLL!!!!! Too bad, they are invincible..
Cats shouldn’t afraid of anything! rawr!! Cats shouldn’t afraid of things like this.. I afraid it’s still there..
i kill them on sight!!!! Oh my.. rest in peace.. cockroaches.. I would be too scared to go in! I’m extremely afraid of them as well. wonder why do they exist in the first place. And worse, my hostel area has loads of them. meow patut cari oggy utk dapatkan tips menghalau lipas! especially those flying one’s! it’s as if they target u! they never fly away, always TOWARDS u! wahhhhhh the scariest of all!!! cockroaches are nothing compared to lizards.